Keto diet update: week 2. I wasn’t going to post again about my ketogenic experiment. Well, not immediately. However after getting 28 more followers of my blog in the last week, I figured that perhaps this was something people were interested in hearing more about. It makes sense. A ketogenic diet is the extreme version of a low carbohydrate diet. And when you combine the words ‘diet’ and ‘extreme’ in reference to an eating pattern, then that’s bound to spark some interest. Think ‘magic bullet’ It’s like Beyonce endorsing the lemon detox diet. Except she likely received a hefty payout for the pleasure of losing 9 kg in 7 days (to then gain it all back… but who’s counting?) I’m still waiting on my cheque. Not sure who to contact, however. Within the last week I have delved further into the information I have around what constitutes a ketogenic diet. How much of what we read on the internet is in fact ‘ketogenic’ and how much is someone’s misinterpretation of it? For example, there are a few websites that provide information on the ratio of carbohydrate (CHO) and protein to fat that you should aim for when adopting a ketogenic diet. This keto calculator here gives a good overview of the information that should potentially be taken into account when providing structure to the diet. I used this as a starting point with regards to CHO and protein, and adjusted the fat grams per day so the end result wasn’t a hefty calorie deficit leading to unwanted weight loss. However, as that is the end goal for a good number of people, it will provide some idea of the macronutrient totals. On that note, there is a misconception that you can eat fat ‘ad lib’ and you will lose weight or – at the very least – not gain it. That’s just not the case. I know many people who have dabbled in ketosis and have not been successful with their desire to lose weight, whereas others have found the weight has literally dropped off. Of course, as ketogenic diets are the extreme end of a low carbohydrate, high fat (LCHF) diet, there are many people who have lost weight just by opting to include more real food in their diet and have spontaneously eaten less due to the higher satiety factor, without the need to meticulously count macronutrient grams, weigh food portions or think twice before eating out. This can be a source of frustration for others who have committed to doing all of the aforementioned but have not had the same experience. I did wondered if part of this is to do with the macronutrient ratios – that their protein and/or CHO grams are too high to truly get into ketosis and enable the body to adapt to burning fat. I emailed Stephen Phinney – one of the world’s experts in the ketogenic diet and co-founder of the Art and Science of Low Carb – a website where you can find information on the research he has conducted and the books he has authored with Jeff Volek and Eric Westman. His response? And that makes sense -so potentially it has less to do with the ratios as a rule, however they are the starting point for some people and could help if they are having trouble regulating their protein intake. For some, however, merely recommending they eat fat to ‘satiety’ is too difficult for them to put into practice successfully and still lose weight. It is entirely possible to get into ketosis and have blood ketones above the 0.5 mM that illustrates they are being used as the predominant fuel source. However, the amount of fat consumed is in excess of what they need, and the fat that is used for energy is provided by the diet, therefore there is no physiological requirement for burning body fat. Frustratingly, despite meticulously counting macronutrient ratios, watching protein portions and being mindful of situations that could blow them out of ketosis, those jeans are not getting any looser. While managing fat hunger is the key, it’s really difficult for some to recognise their fat hunger – as this is relying more on the physiological signals sent by the body in response to the food eaten. For many people, the hormones responsible (insulin and leptin being the predominant ones) are either disrupted due to poor metabolic health and/or being overridden in the context of the food environment they have been exposed to for most of their life. The food choices that have been part of a ‘healthy, balanced diet’ have constituents that drive appetite and feed into our food/reward system in the brain that extend far beyond our physiological needs. Couple that with ingrained behaviour whereby we must eat what is in front of us, it is rude to decline a piece of home made cake, and those around us comment on what we choose to eat or not to eat, it is no wonder many people have lost touch with their true appetite. As with any change in diet, it’s such a good time to assess the effects of those environmental cues on your own appetite and adjust where necessary. Serving smaller portions is a great start when following a ketogenic diet, as fat is naturally more satiating. Chewing food properly and finishing a mouthful is also key. For some, putting their knife and fork down in between bites is a good way to do this. Eating without distractions is often recommended, though some can read/browse the internet while still being mindful of their food intake – so use your honest judgement here. 1. For the first time in memory I’ve been consistently sleeping through the night. I mentioned this last week but in the last seven days I’ve slept through the night on all but one occasion. I put this down to a reduction in vegetables that I’ve been eating. Don’t go thinking I’m vegetable free – at ALL! I’d easily meet the 5-a-day recommendation for me, you and that person who sitting over there on a normal day. Now I’d probably just meet mine and yours. This reduction in water means I’m no longer getting up in the middle of the night and despite the fact that humans likely didn’t sleep throughout the night back in paleolithic times, I’m loving the uninterrupted sleep I’m getting. 2. While I was meticulously weighing my food portions in the first 10 days, I’ve reached a point where it’s easy for me to eyeball amounts. I have eaten out a few times over the holiday period, stayed at a friend’s house for three nights and maintained my ketone levels between 0.7 mM and 3.9 mM. 3. Training hasn’t been that bad, aside from an almost repeat of last Friday’s run. This time it was on trails and I knew within two minutes it was going to be a long 90 minutes. I believe this was down to dehydration actually – my heart rate shot up immediately, then settled, though was still a hard run. There has been a slight decrease in strength for my weight training also. However I’m a bit slack on that front so there are obviously confounding variables (as with all of this…) These have been offset by some awesome sessions too. 4. Throughout the day my energy levels drop off markedly – more than usual I believe. I think this will change as I adapt. I understand, according to Steve Phinney, that it can take up to 12 weeks for that to occur. Perhaps this is longer than a four week experiment. 5. Peter Attia, The Eating Acadamy, is a WEALTH of information – the posts are just the start of it. He is amazing with his responses in the comments sections and I’m learning a lot there. Go over and check it out if at all interested. 7. Fat – from between 130g – 200g per day depending on the day, in the form of cream, nuts, low carb desserts, olive oil, coconut oil, butter, cheese, coconut cream – is not making me fat. So… have you gone all keto? Yes. But unlike my decision to ‘go paleo’ this was a predetermined, calculated, conscious decision and not ‘by default’, which is how my whole food philosophy came about. And that’s largely because it would be very difficult to just ‘go keto’ without some predetermined, calculated, conscious decision making occurring. Although, with the wisdom that is obviously gained from now 9 days of carbohydrate and protein restriction, and the consumption of vastly increased grams of fat I am pretty sure a lot of people out there who believe they are ketogenic might not be – if the websites devoted to keto foods and recipes are anything to go by. How on earth would they be in ketosis with protein portions that large?? Now why would I bother jumping on the keto bandwagon? A few reasons. A lot of people I know have tried it and I’ve reached a point where I’m curious enough to see if I had the discipline to follow such a strict dietary regime (regime is a rather harsh word, but I feel it’s applicable for this diet). Whilst some people observe what I eat and exclaim how ‘disciplined’ I am (like it’s a virtue), I love what I eat and eat what I want – eating a real food diet isn’t about discipline, it’s about pleasure. The strict limits on not only carbohydrate but protein requires discipline largely reserved for the very analytical and uber intelligent (i.e. Peter Attia over at Eating Academy). The second reason is self experimentation – a far cry from the days I mocked people for using the term n=1, I now wanted to experience, document and reflect on how it feels to undertake a ketogenic diet. A great way to learn and understand anything is to experience it. My weight and body image issues growing up, for example, have provided me with better insight into the challenges faced by clients who battle with similar problems, despite the fact that, physically, we may look very different. As a number of my clients now have heard of a ketogenic diet and just want to try it, or have legitimate health reasons that warrant a ketogenic approach as a tool to improve metabolic health markers, then to be able to speak from experience is obviously advantageous. The final reason is because Caryn gave it a go. And therefore, out of those left in our research team at Human Potential Centre who had yet to follow a ketogenic diet, I was the only person left who had yet to try it. Other than Scott. And as he is still drinking energy drinks (albeit he’s switched to the sugar free variety, and swigs water after having it to protect his teeth), it’s fair to say our respective diets are poles apart at this point. However he has recently jumped on the Twitter bandwagon so I’m sure it won’t be too long before he’s swigging bottles of MCT oil and professing the benefits of butter like it’s nobody’s business. However, I am a nutritionist and, as the last one standing I felt not a small amount of FOMO by having not at least tried it. I’m actually in the best position out of my colleagues – as I can learn from their mistakes. Like I did at St Johns. As a cadet in my younger years we had regional competitions that required assessing a medical emergency and stitching or bandaging people up with the one who illustrated the most knowledge walking away with the trophy. As my last name is Williden I was usually last to front up, and my St John’s group would filter information to me so, by the time it was my turn, I was armed with all necessary information to go into the medical situation and assess, inform, and bandage with skills that would make me an indispensable member of McDreamy’s team. This ketogenic diet experiment is not dissimilar, minus the trophy and the badge to stitch on my jersey. So Day 9… A short time, sure. But I’ve learned a few things already. It’s hard to stick to the protein limit. Really hard. I got an inkling of that when I read Tim Noakes’ Real Meal Revolution recommendation of keeping animal protein to 80g per meal absolute amounts. But who also knew vegetables contained so much protein? That it is hard to get the amount of fat necessary for ketosis and overeat. My food volume has dramatically reduced. Obviously, though, if you do eat more fat than you need, this will be reflected in weight gain/gastrointestinal problems etc over the long term. That I’d wildly underestimated the amount of peanut/almond/coconut butter I actually ate in normal life (like somehow the Gilmours 3kg bags of nuts just disappeared of their own accord). I’ve never tracked my food to this extent (using Easy Diet Diary app for iPhone) and it is a real eye opener. That not all food apps are created equal. For example, Fitday lists broccoli has having almost as much carbohydrate as pumpkin. It doesn’t. That for some people to get into ketosis, 50g of carbohydrate (CHO) might be too high, and closer to 30g is better. Is this a female thing? Maybe. This is clearly insight from Caryn who passed this on. While the academic literature often places limits of 20-30g CHO/day, there are also studies that refer to a low carbohydrate, high protein diet as ‘ketogenic.’ Confusion is clearly not limited to the bloggersphere. There is a lot of misinformation on the Internet about ketogenic diets. But there are some very smart people writing about this – way smarter and knowledgeable than I am. People are unnecessarily verbose in recipes and post too many ‘stages’ pictures. That, despite being my dislike of Thai food and Thai restaurants, I really like my own Thai red curry coconut chicken. (I must be the only person who doesn’t like Thai food. I know. Is it the cheesy American cover songs and proliferation of sweet chilli sauce? Maybe). That making pastry is way easier than I ever realized. That I make really good rhubarb crumble and chicken curry pie. These and other recipes are over on my Facebook nutrition page – definitely check them out. Training wise – I’ve felt great. Up until Friday and then it felt like I’d been turned upside down and emptied out. Hardest. Run. Ever. Barely breaking 5.30 k’s (actually that’s an estimate – thankfully Nicky’s evil Garmin wasn’t working and I was too scared to wear mine). Friday and Saturday were complete write offs but today’s run – storming. Seriously. Even after doing weights yesterday I woke up feeling better than I have in a long time. During normal day: I’ve felt flat. A bit sick on some days too – and particularly on the days when I missed having a coffee with cream, or something similar, which reduces amount of fat I start the day with. But, again, today I feel back to being awesome. Twice during the week I woke up and couldn’t get back to sleep for an hour. Unusual for me, though not unheard of. Last night I slept right through. This may be due to the diet, might have nothing to do with it. I miss fruit. And dates. And wine (for now – I’m abstaining for now, given that alcohol is preferentially metabolized in the body – which would largely offset my efforts to turn fat into the go-to fuel tank). While I, like many people, have my go-to foods, nine days into this and I’ve needed a bit of variety to keep me focused. I typically eat a TON of vegetables, and would feel largely dissatisfied to sit down to a third of that with extra dressing added as a fat source. It’s a shame that I’m making all these awesome meals and I have yet to meet my future husband. He is seriously missing out on some good eats. I know. I’m late to the party on this. Just like the paleo/real food/whole food movement, I’m pontificating on something that some of you reading this would have read about, adopted, wrote about, reflected on and then moved on five years ago. If this is you, and you have some wise words then please share! This is a learning curve for me (and clients) so the more I know the better. So I’m hoping for that ‘keto’ clarity, that ethereal experience people talk about, and that today’s run was indicative of the amazing training that I will experience as I undergo this keto experiment. (It goes without saying that this will of course turn me into an amazing athlete lol) I’m also hoping that my experience will add to the information out there that seems, for the most part, from the male experience. There are a few women writing about it, but it is largely a male dominated space. I will keep you updated, both here and on my Facebook page. Right. Off to make keto hot cross buns. Because nothing says Easter like almond flour buns dressed with a white cross. Healthy Food Guide… jumped the shark? I hate it when I feel disappointed or let down. I’m a person who invests in relationships. I feel that you get out what you put in, and I typically look for the good in people or situations rather than the bad. I also think that I’m slower than most to give up on something; I find I can make excuses for people or situations where I think that, deep down, the intention was good, but the consequence didn’t reflect that. I will more than likely give them benefit of the doubt. So I’m loyal then too – kind of like a Labrador. Which likely explains why I was perusing the Healthy Food Guide magazine on Friday, as I have subscribed since day one. Now, just to clarify – I used to love the Healthy Food Guide when it first emerged. I believed it to be a reputable source of nutrition information that the general public could easily digest. It also had some good recipes that, with the addition of some seasoning most of the time, were good options for time-poor people who didn’t know where to start with putting together a healthy diet. I found the section comparing like products a useful tool for clients to get their heads around choosing through the seemingly endless products on the supermarket shelf, and welcomed the articles that delved into current health and nutrition topics, knowing that the advisory board (consisting of top nutrition researchers in the country) would have signed off on the details. Of course, as my knowledge base has increased over the last couple of years, and I’ve steadily moved away from processed food and coached clients towards a whole food approach to diet, I’ve relied less and less on the Healthy Food Guide as my go-to resource. I get back issues delivered to give to clients, and always appreciated that the Healthy Food Guide would send these to me to be able to do this. However I have only very recently stopped this, as its usefulness has increasingly diminished in light of increasing frustration around the nutrition messages in the magazine that don’t reflect more current and evidence-backed views on health. One of the reasons that I still get it is because I like to see if the magazine has moved at all from the conservative view on nutrition and health – it’s important for me to be aware of this so I’m informed when I talk to clients about the magazine. I’d not want to just assume something without background knowledge. I have taken a much more ambivalent view to the content, just skimming the magazine for any interesting new products or gadgets for the kitchen, and any recipes that I could adapt to fit in line with how I like to eat. I had hoped also that with the emerging messages coming out that challenges the status quo understanding of health and nutrition, the Healthy Food Guide would also move on. Suffice to say, this hasn’t really happened. I think that the underlying message of whole food is coming through – however the recommendations that are aligned to low fat and high carbohydrate still exists with their sample diets geared geared towards this. I’m not surprised then when I see an advert that applauds the reader’s choice of Cheerio cereal for breakfast; the Healthy Food Guide endorses it in both the print and television media, consistent with their overall message. I actually doubt that anyone there would personally think it’s a good breakfast choice that sustains someone and keeps them going through the entire morning, but again, it’s consistent with their message regardless of how they actually might eat. And, when it comes down to it – the magazine is a business – and while they might be in the business of promoting healthy eating, they also have a bottom line. So, should I be surprised to see this when I was flicking through the magazine on Friday night? Wow. An appetite suppressant. Really, HFG? Yes. I think so. 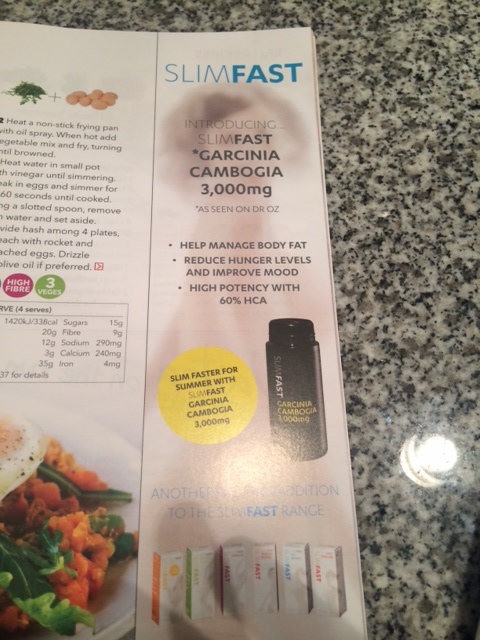 Surprised and disappointed – to advertise an appetite suppressant goes totally against the message that they promote. Garcinia cambogia purportedly boosts satiety from food after eating, thereby helping people lose weight. Unsurprisingly, recent reviews reveal that (at best) this isn’t supported by research, and at worse might not even be safe. The team over at Examine (as usual) unpacks the research beautifully. I’m not sure how it even got through the editorial team actually. This ‘quick fix’ goes against everything they stand for. It must have been an oversight, because otherwise this would be akin to selling out, really. This totally sends mixed messages to the consumers, worse than a full page advertisement for coconut oil one page over from an article on the evils of saturated fat. Maybe I’m overreacting (I could be – it’s been a busy time of year and I’m probably a touch more irritable than usual) but this really does illustrate that the magazine is, at the end of the day, in the business of making money. In my humble opinion, this totally jumped the shark. Time to rethink the low-fat dairy option. I teach a first year compulsory nutrition paper – on two campuses. I introduce the macronutrient and micronutrient functions, the food and nutrition guidelines and the main public health issues around nutrition and health. People often ask me how I deal with teaching the students guidelines and recommendations that I don’t fully endorse. For the most part it’s not a problem. This is a university environment. The students are adults now – or need to practice being adults. I tell them at the start of the course that it’s the nature of the paper to teach them what the recommendations are – if these change, then obviously the base content will change. I then go on to tell them that, in this environment, it is their responsibility to challenge and question what they hear. Far from avoiding it, we encourage their insights and discussion. University is about nurturing critical thinking, not rote learning. Last week we covered the Food and Nutrition Guidelines. This week it was micronutrients. As I was standing up there, discussing the benefits of vitamins A, D, E, K, and the best food sources for each, there was no better illustration of the conflicting messages that exist within our food guidance systems. In the Food and Nutrition Guidelines we are recommended to choose low fat dairy products. However, with the fat soluble vitamins, of which dairy products are a great source for vits A, D and K, it’s far more beneficial to consume in the presence of fat to maximise absorption. In addition, increasing evidence is pointing to the benefits of dairy that extend beyond the delivery of calcium and vitamins, and that the fatty acids present in the dairy fat could well be protective against weight gain, cardiovascular disease, diabetes and some cancers. A Swedish study over 12 years found men who ate full fat milk, butter and included cream dairy products were less likely to be obese than those who avoided it, and (in combination with a high intake of fruit and vegetables) was protective against coronary events. In another, there was a reduced risk of colorectal cancer with the consumption of more than four serves of full fat dairy among 60,000 middle aged women, compared to those with the lowest intake. In adolescents, there was no association between full fat milk and obesity, and in fact it was skim and 1% milk that was associated with weight gain. In fact, this meta-analysis of 16 papers found that 11 of them reported beneficial effects of consuming full fat dairy products on obesity and metabolic health outcomes. Interestingly, the research showed association between dairy fat and health is much stronger in European countries than it is in the US. When it was investigated, the researchers found a large proportion of dairy fat is consumed in the US was in the form of more processed food choices, such as ice cream and pizza. Europe retains a stronger tradition of consuming full-fat traditional dairy products such as plain cheeses, plain butter, and unsweetened yogurt.Another difference between Europe and US is the quality of dairy fat present in the foods. Typical dairy farming in the United States is highly industrialised, with a focus on maximising yield per dairy cow. Among other things, cows are treated with growth hormones, and the cows are not as likely to be pasture fed, relying instead on corn and soybean-based feed concentrates. Thankfully for us in NZ, we are less industrialised, where cows are (more often than not) grass fed. So what makes full-fat dairy beneficial? For one, the increased fat in the dairy products will naturally be more satisfying – thus potentially help with regulating food intake more than the skim or trim milk options (higher in protein and carbohydrate) would give. Science is also pointing to the fatty acid composition. Dairy fat is a rich source of butyric acid (C4:0), a short-chain fatty acid that, for the most part, is produced in our gastrointestinal tract. I’ve talked about butyrate before in relation to resistant starch and our gut health. It’s extremely beneficial for our immune system and in a small clinical study, 4g daily of oral butyrate over 8 weeks reduced inflammation in the gastrointestinal mucosa and improved Crohn’s disease symptoms. Full-fat dairy products also contain conjugated linoleic acid (CLA). This is a naturally occurring trans fat which has been found to be beneficial in health. Unlike industrial trans fats found in many processed foods that are well established to be harmful, the structure of natural trans fats has been found to be reduce risk of heart disease, diabetes and cancer found in population based studies. Animal models have found a reduced plaque formation in the arteries in rats and it also seems CLA is associated with better control of insulin in the body, thereby reducing risk of diabetes. Now doesn’t that just make sense? I’m sure that, regardless of what ‘nutrition camp’ you sit in, most would agree that New Zealand should take a leaf out of this book.